WHY HAVE PERSONAL ART TUITION? You will enjoy my undivided attention and enable you to make rapid progress in a short time. The tuition will be tailored to your own needs and interests. Couples, parent and child or two friends are welcome to share the tuition session. New bonds of friendship develop when two people learn to paint together. Many people want to learn to paint a picture. Usually they choose a favourite view, flowers, portraits or pets. Being creative is beneficial for well being and health. Stress levels are reduced when painting or drawing. You may be rekindling a past interest or developing a new hobby that will become thoroughly absorbing. Creating personal gifts for family and friends is uniquely rewarding. Let me help you improve your portfolio for entry to art college or to excellence in school examinations. To brush up on your skills and fulfil your creative potential is both relaxing and rewarding. Meeting in my studio gives the right atmosphere. 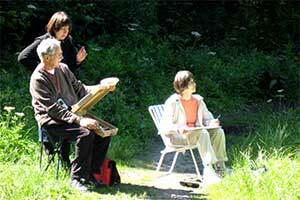 In warmer weather the lessons can be taken outside and if time permits, down in the nearby beautiful Bradford Dale. If you already paint you can bring your artwork for critique. This can move your work in new directions and help achieve goals. 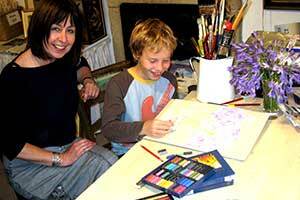 Private tuition will give you the confidence to get started and join a class or art group. In winter months I hold life drawing classes in several locations. During summer I run weekly afternoon classes in the Peak District landscape. Check my website for current details and programme. We’ll keep a record of subjects covered in a written personal learning plan. General skills; drawing with pencil, graphite, pen and ink, brush and wash, charcoal, chalk and pastels, collage, oil pastels, oil paints, acrylic, watercolours and mixed media. How to measure and achieve proportion, three dimensional representation with tones. Colour theory, perspective, composition. Bespoke weekend courses in any media are available. Studio based or summer painting en plein air with a few hours of personal tuition is a good combination to develop your skills. Discuss your needs with me and I’ll structure the tuition to achieve your aims. I can arrange accommodation for you locally if required. In the evenings take pleasure in the good places to eat all around the Peak District National Park. Art lessons can be arranged as a gift for friends and relatives. Telephone me and I will send a handmade card to the recipients giving details as required. Lesson are always arranged at your convenience. This may be weekly, every fortnight or perhaps monthly. Minimum one hour sessions to whole days are possible. Students often prefer one to one teaching. It is not unusual for couples, friends or relations to have lesson together. You may already know what you wish to learn. If you are a beginner then I can help you plan a course of basic skills and sound improvement. Often artists bring their previous artworks to be appraised at each lesson. The best way to arrange a lesson is to telephone me now on 01629 636763. Leave a message if I am unable to answer, I may be teaching. There is an initial free taster session of fifteen minutes to see if you like what is being taught to you.. This is put in front of a one hour session so you can sample the method of teaching. Hopefully you will continue for the full hour and enjoy the new skills, techniques and knowledge acquired.